How to cook a "big Mac"
Many love dishes that cook at McDonalds. Fans of fried potatoes, I just love the local potatoesof the village. However, something similar can be cooked at home using a conventional oven. The most important thing is to use only young, smooth tubers. - 5 tbsp olive oil. Potatoes should be well washed. It is convenient to use a hard brush. 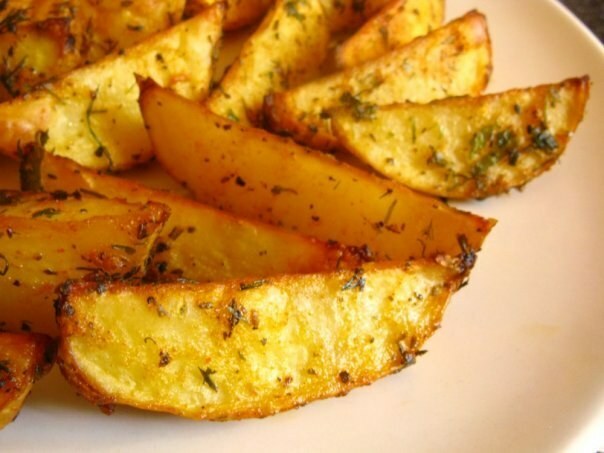 Recipe for potato wedges in McDonalds does not imply that you have to clean the tuber using a knife, so it is best to purchase potatoes, the skin of which is still very thin and delicate. Washed potatoes need to thoroughly dry. It is convenient to use paper towels. Cut the potatoes into quarters. If the tubers are large, they can be divided into more parts. Importantly, the resulting slices were about the same. Now you will need a mixture of peppers. You can buy it in the store ready, and if not found, take equal parts black, white and red pepper and mix well. Take half teaspoon of this mixture and connect with the rest of the spices. From the resulting composition will separate one teaspoon and connect with butter. To the oil, dip the potato slice, then sprinkle on top of dry, pre-prepared spice mixture and place on a baking sheet. Repeat this procedure for each of the slices of potatoes. Do not forget to grease the baking sheet with oil. Preheat the oven to 200oC and place a baking pan with potatoes. Bake the dish for about 30-40 minutes. Potato wedges ready. If you live in a private house and there is a Russian stove, do not hesitate to cook country-style potatoes in the oven. Nothing I don't. There she is incredibly juicy and flavorful. You can experiment and when cooking potatoes to use other spices or herbs. Sprinkle slices of those herbs that you like the most. Perhaps this is a hearty and delicious dish will soon begin to get you even better than McDonald's. Children usually like potatoes. But more often they prefer the one that cooked in the deep fryer. However, potatoes can be a great, less fatty alternative. If your country-style potatoes cooled down, do not rush to warm up. This dish is very tasty and cold.